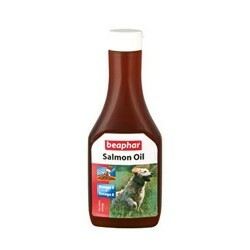 Product Details- composition- Salmon oil(containing Omega 3 and 6 fatty acids),Nutritional value-8900 Kcal-Kg. Suitable -Dogs .Quantity-425 ml. Product Information -Salmon oil is a tasty complementary food for dogs that assists the digestion. Salmon oil contains the fatty acids Omega 3 and 6 in the correct balance to help ensure a healthy heart and blood vessels. Salmon oil keeps the joints supple, gives extra energy and has a beneficial effect on reproduction and nerve function. Salmon oil is recommended as an energy source for energetic dogs that take a lot of exercise (for example sporting dogs). Beneficial effect on reproduction and nerve function. Helps pets with inflammatory conditions such as allergic skin diseases, nephritis, etc. Helps pets with chronic illness like cancer.